Balance, part of a complete fitness plan. balance can help you in all levels of sports and fitness. All sports require a certain degree of stability, and core strength. Increasing that stability and having a better knowledge of your center of gravity may give you the edge you need to out-perform your competition. Having a strong core and stability can also be critical as we get older. For people over the age of 60, more serious injuries are caused ever year by simple falls because of lack of balance. But with a regular balance training regime you can significantly improve this area of fitness. Look for balance-boards at the gym. They are fun and with practice you can master them. As you become an expert, carefully try balancing with your eyes closed! Use Bosu and Stability Balls as part of your workout routine to build better balance. These unstable platforms challenge your muscles to find your body's balance. I will often have clients do resistance training, such as curls or dumbell presses, while standing on an upside down Bosu Ball. Do standing exercises such as curls, shoulder presses or lateral raises standing on one foot to increase stability. Always work both sides, we all have one side that is dominant. To really excel your fitness or performance at something, you need to shore up your weak side, so you no longer have a weak side. Are you located near the water? 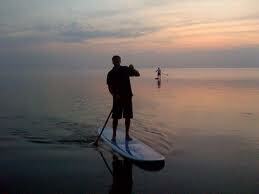 Stand-up paddling is a great way to increase overall balance while having some fun. So remember to add some "balance" training to your current fitness routine. It's a great way to add variety to your workouts and increase sports performance. To return from the balance page to the Fitness Tips page click HERE.